We’re off to the city of churches this morning to get to know Hen, who’s just released her debut single under her new moniker. The artist formerly known as Julia Henning has previously had national audiences wrapped around her little finger and has enjoyed the support of the team at Triple J. But now it’s time for something different. And ‘Raincoats’ is just the beginning. 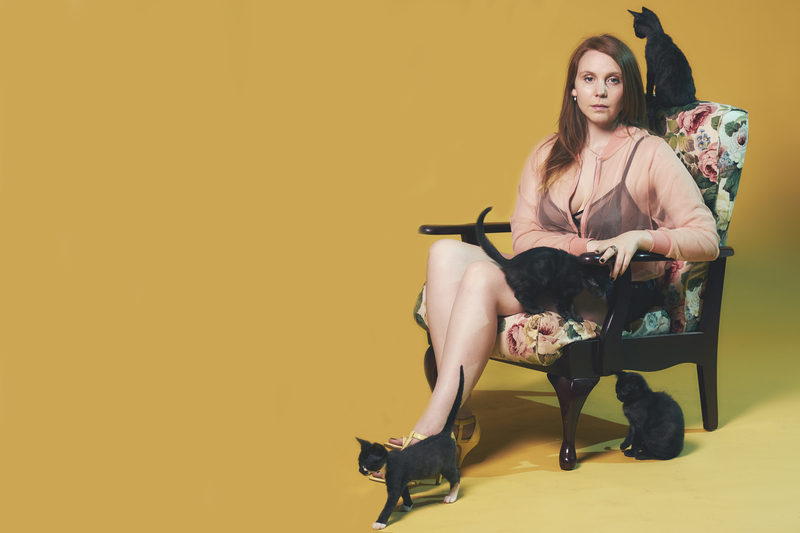 Get to know her, her music and what the cats are all about (above) in our latest feature. 02. Where are you based? Adelaide, South Australia. 03. How did you get your start in music? My parents tell me I was always a very loud child. There’s a lot of videos of me belting out ‘The Grand Old Duke Of York’ while prancing around the house. Being vocal and musical always came very naturally to me. I started writing songs when I was seven but I think the biggest start I got in music was when I decided to play two shows at the Sydney Opera House having never done a show of my own originals before. I had 12 weeks to write enough material for a 90 minute show. The whole thing was a massive trial by fire but I learned so much. 04. Give us five words to best describe you as an artist. Rebellious. 05. Tell us a little bit about your sound and how it developed. A year ago I decided that I wanted to change my sound and my name. I had to dig really deep and find out exactly what made me tick. My sound now is very true to who I am. It’s a sweet blend of electro-pop with some alternative/indie vibes, it’s fun but complex, reflective and very honest. I used to try and make music for what I thought other people/stations etc. wanted but that’s not really what making art is about. It’s about being real with yourself and making things that come from the heart. As soon as I started making music that made me happy, it all just fell together. 06. Who have been your musical influences? Anyone who knows me knows that Leonard Cohen has been a huge influence. His poetry, music and humility are all things I aspire to. My dad has very eclectic tastes in music so my influences are pretty varied, but one in particular that’s been influencing me since I was very, very little is Flanders & Swann, a musical comedy duo from the ’50s and ’60s who wrote some amazing songs, many with a twist ending. Something I utilise often in my writing. 07. What are your favourite songs of all time? I love many, many songs but some I never get tired of hearing are: Leonard Cohen’s ‘Alexandra Leaving’, Flanders and Swann ‘The Sloth’ and Halsey’s ‘Gasoline’. 08. What was the first album you ever bought? The ‘Lion King’ soundtrack. It was very exciting. 09. Give us a little fun fact about yourself that people might not know. I volunteer rescuing and fostering cats and kittens. Right now I have a litter of five kittens that were orphaned and need bottle feeding every few hours. They’re all named after characters from ‘The Princess Bride’ and they keep me on my toes. 10. What would your chosen career be if music wasn’t an option? I’m very passionate about animals so I took up a hobby studying a combined degree of Psychology and Animal Behaviour. If music wasn’t an option I would certainly love to work full time in this field. 11. What’s the best advice you’ve been given in your career? I was told once that my job as an artist is just to make the art. To create something that I’m proud of and get it to the point that it’s ready to go out into the world but that once it’s out there, to let go of the outcome. From that point, I have done my job and how people react or far it goes is not up to me anymore. Make it as good as you can and then let it go on its own adventure. 12. Tell us about your latest release. ‘Raincoats’ is the first single from my upcoming album, it’s the first time people will be hearing the new sound I’ve been working on for so long and I think it’s a good example of the direction I’m heading in. It’s fun, emotive and blends a few genres in an unexpected way. The lyrics are about the struggle to trust yourself and others when you’ve been hurt before. 13. What do your future plans involve? I’ll be releasing more music soon which I’m very excited about. It’s been a long time working on this album and I’m very keen to share it! Beyond that I’ll be making some more music videos, continuing to write and releasing to the US! Which is a bit nerve wracking but also very exciting. 14. Where can our audience catch you live? I’ll be on tour with Rachael Leahcar all through November which should be a lot of fun! Tix available from www.rachaelleahcar.com.au/shows.html.